Windows file server administrators often have to force close the shared files opened by users. This task appears when several users work with the same file simultaneously. Often, if the software is not working properly or the session is terminated incorrectly by the user, it often happens that files in the shared folder are still open (and locked), and other users can’t make changes to them. 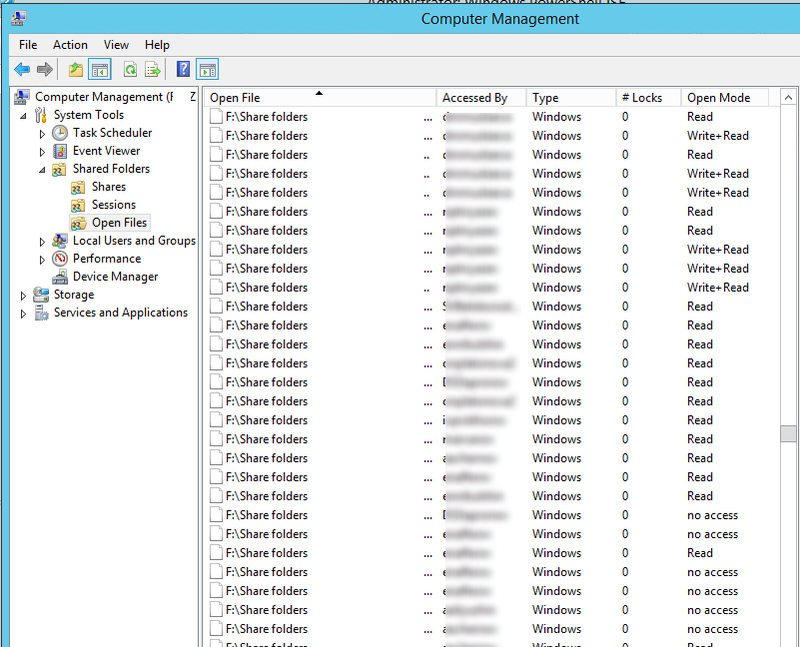 In this article we’ll show how to get the list of open files on the file server (running Windows Server 2012 R2), find out which user locked a file on a shared folder and close (reset) these file sessions. You can get the list of files opened by users on Windows file server using built-in Computer Management (compmgmt.msc) graphic console. Open the Computer Management snap-in on your file server (or connect to the server remotely from the management console running on your computer) and go to System Tools -> Shared Folders -> Open files. The list of files opened on the remote server is displayed on the right side of the window. The list contains the local path to a file, the name of the user account that opens the file, the number of locks and the mode in which the file is opened (Read or Write+Read). If a user accessed a folder or a file in the shared folder on the server remotely using the SBM protocol, a new session that determines the connection is created for the user. User connections are managed using through session IDs. The Openfiles command has another useful feature to view the list of locally opened files. To use it, enable Maintain Objects List option using the command: openfiles /local on, and restart your server. After that, the files opened by local processes will be added to the list of open files (it is recommended to use this mode only for debugging purposes, since it can negatively affect the performance of your server). Openfiles /Query /s lon-fs01 /fo csv | find /i "filename.docx"
/i key is used to make case-insensitive file search. Openfiles /Query /s lon-fs01 /fo csv | find /i "salereport"| find /i "xlsx"
Of course you can find this file in the Computer Management GUI, but it’s less convenient (this console doesn’t provide search feature). 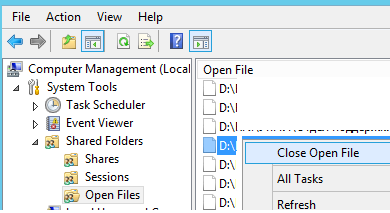 To close an open file, find it in the list of files in Open File section and select Close Open File in the context menu. Openfiles /Query /s lon-fs01 /fo csv | find /i "farm"| find /i ".xlsx"
New cmdlets to manage shares and files on an SMB server appeared in PowerShell for Windows Server 2012 / Windows 8. These cmdlets can be used to remotely reset connections to an open file. You can get the list of open files using Get-SMBOpenFile, and close a file (reset a connection) using Close-SmbOpenFile. Confirm closing of the file by pressing Y. To remove the confirmation of force closing a file on a file server, use -Force key.